Left: View from inside one of the buses that transported us from Neiva to Pitalito and back. A 5-6 hour drive over treacherous mountainous roads. Right:There are agricultural shops everywhere in Pitalito, with a wide range of processing equipment, livestock food and general farm maintenace equipment. On Monday the 1st of February I took a late flight from Heathrow to Bogota. Square Mile sent me to Colombia on my first origin trip to a country from which we buy lots of coffee! From Bogota I took a connecting flight to Neiva, the capital of the department of Huila and located several hundred kilometres to the south. We consistently buy from this region because of its high quality and consistent harvests. A good example was the popular Los Monjes from Oporapa, which I used last year during my Brewer’s Cup presentation. I travelled a little further South of Oporapa to Pitalito, the second largest city in Huila, with a population of a little more than 100,000 people and the region from which our La Serrania originates. After 24 hours of travelling, this was my final destination. I attended the Huila Best Cup 2016, an event organised by coffee importer Cafe Imports and exporter Banexport. A very important event for the area, because it not only allows all the farmers to showcase their coffee, but also gives them a stage to prove to the international coffee community that the coffee they are producing is worth these kind of auction prices. After an extended time in transit, finishing with a long and winding drive over the tricky mountain roads of the Andes, we were allocated a hotel room and had some much needed rest, as the next few days promised to be busy! The bus that transported us to the school, farms, mills and everywhere else we needed to go from the hotel. It is equipped with a big sound system, which constantly plays reggaeton. The SENA school location. Built in the shape of a coffee bean. The idea behind the event is to showcase some of the best coffees from around the area. An impressive amount of more than 600 farmers had sent their coffee to enter the competition. A selection of the 30 best tasting coffees was collated by a local jury and it was then down to us, the invited judges, to choose the best from the top selection. After 3 days we had made a selection of the best 12, and these would be sold during an auction on the last day. Previous years had seen some excellent prices paid for the premium coffees, so we were excited to find out what would happen this year. – The landscape is simply incredible, coming from the flattest country in the world, I thought England had some impressive hills. The mountainous views in Huila were a whole lot more impressive than what you see in Kent! Back to cupping coffee, our first working day we were driven to a park built by El Servicio Nacional de Aprendizaje (National Training Service), or SENA for short. The organisation had built several buildings here to accommodate an agricultural education centre, this was where we tasted the top 30 coffees and some other experimental coffees that were being offered by the organisers. The first cupping we did as a group was to calibrate, with the main goal to have everybody agree on certain characteristics. It turned out to be quite interesting and a bit controversial as 9 of the 10 coffees were defective, and we were working with a large group consisting of some very experienced cuppers and some less so. After some confused faces and full spitoons, it was great to see that many people picked out the defects, even when they were minimal, and thereby our calibration was a success. We then proceeded with our first round of 10 coffees that were part of the actual event. Straight away it was noticable that these were of a much higher quality, and moods were definitely better following this set. Almost all coffees were scored between 84 and 89, and some of us were even handing out 90’s. With a mornings work well done, it was time to visit some farms, eat local food, drink some interesting beer and enjoy the beautiful scenery. The lovely team that set up our cuppings. Mainly students and teachers at the school. For three days this was our usual schedule, it was work and a holiday all rolled into one! Some very interesting coffees featured on the tables and some peculiar tasting notes were linked to them, with both positives and negatives being documented. These would later be communicated to the farmer, so they could apply this to their quality control. On the fourth day we had sifted out the top 12 by averaging our scores and then we cupped them all again to give each a fair chance. It was a magnificent table! After the top 12, we were treated to a motley cupping, which featured some stunning and very interesting coffees. There was Geisha’s, Pink Bourbons and weird processes. A lot of 90+’s were handed out that day. The auction place. In the centre square of a mall. Our final working day ended up being the most fun as this was auction day. The day the top 12 would be sold to anyone present at the auction. We were all driven to a mall which had a large centre courtyard complete with a stage and the top 30 farmers were all present with their families. After we, the cuppers and buyers, were allocated our seats the auction was ready to start. 2.These farmers have been working very hard to increase the quality of their coffee, because we, the consumers have demanded it. If we want this effort to continue we should be paying more than the commodity price. Now, to be clear, $3.50/lbs of coffee is more than twice the price that farmers would receive without any auction. So, it is not difficult to realise how excited the crowd became when coffee number 12 was sold for more than that. It is also not hard to see that the crowd was ecstatic, when the top 5 received more than $10/lbs. The highest scoring coffee was sold for an incredible price of $32.50/lbs, and the mall erupted into a true fiesta. People were celebrating and taking selfies with all of the members of the jury. It was a fantastic sight. All top 30 farmers. In front of the stage. Leaving Bogota, after a busy few days. Till next time! The next day we all began our journey home, and I was going to have to say goodbye to my first origin trip. It was always going to be an exciting occasion, but being able to participate in this very special event made it even better. I have learned a lot and can’t wait for my next trip. My next post will be about the farms and the mill I visited. 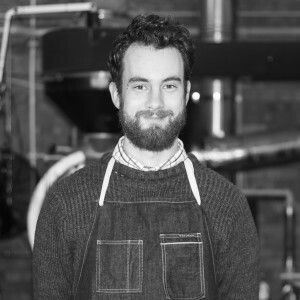 Thijs van Meurs was part of the roasting team at Square Mile Coffee Roasters between July 2014 and November 2016. He was born and raised in Amsterdam and moved to London in 2011 to pursue a career in coffee.